The hand-held scanner LS1203 offers high-quality laser scanning, user-friendly ergonomics plus an extra long service life at a reasonable price. Its design is based on the requirements of small companies. It provides all the performance and functionality that is required to significantly reduce input errors and increase productivity at the POS. Its reasonable price and easy installation make this scanner very attractive for many different retail shops, such as gift shops, boutiques, jewelleries and video shops. It is extremely robust and simple to operate, which also makes it a good choice for applications in workshops, laboratories, chemists’ or offices. 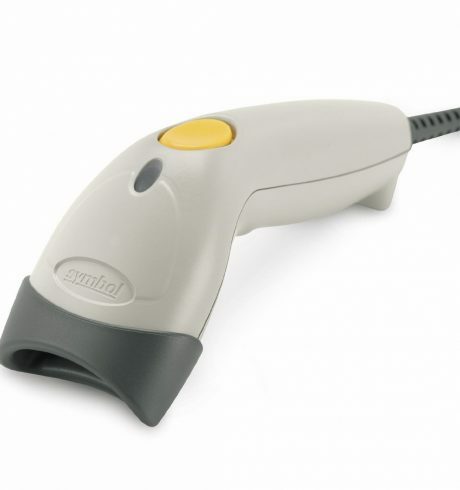 The device reads all commercial 1D barcodes and thus meets all requirements in retail and production. Its single circuit board design and a robust scan element help the LS1203 to cope effortlessly with daily use and unavoidable drops. The housing consists of impact-resistant plastic while all other components are connected in a manner that makes the scanner extremely resistant against even the most careless use. High reliability during daily use provides maximum availability and a minimum of maintenance costs. The multi-interface ensures that the scanner is also compatible with future POS systems. Its Plug and Play concept prevents problems starting at the installation level. Neither drivers nor special software is required, regardless of which interface is used. The scanner is easily configured for specific requirements, with either barcode tables or a software application. Due to its intuitive and ergonomic design, no special training is required – users know instantly how to use the device. Choosing the Zebra LS1203 means you choose the world’s leading provider of handheld barcode scanners and mobile terminals as your partner. Millions of Zebra scanners are used successfully by the world’s largest retail chains every day. Even the toughest device requires maintenance and service for which Zebra has developed an extensive service programme. Products from Zebra help protect your investments and offer maximum performance.